Vignettes & Postcards From Paris is a new edition of the award-winning anthology of writings from Shakespeare and Company Bookstore edited by Erin Byrne and Anna Pook, which includes new stories and poems by Marcia DeSanctis (100 Places in France Every Woman Should Go), Billy Collins, Don George, Georgia Hesse, the top-hatted SpokenWord poets of Paris and others. This special edition features sketches by Colette Hannahan and Candace Rose Rardon and photographs by William Curtis Rolf. 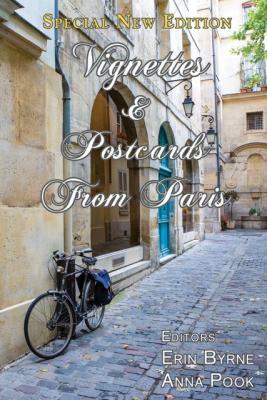 Vignettes & Postcards from Paris is an exquisite collection of stories by writers from all over the world who gathered at Shakespeare and Company Bookstore in the fall of 2011. Since its doors opened in 1951, writers and artists have come to Shakespeare and Company from every corner of the globe for sanctuary, community, and inspiration. Anyone who has spent time there-from the thousands of tumbleweeds who have worked there in exchange for a place to stay to the many famous authors who have at one point called it home-knows that something other happens when writers gather there and begin to create. These stories, in a variety of genres-short fiction, personal essay, interview, travel, and poetry, shimmer with this quality. The book is an anthology from the workshop "Leaping Into the Void," taught by award-winning writer Erin Byrne. Taste rough grains of cinnamon that scratch the tip of your tongue; feel the weight of a pen in your hand during a moment of pure inspiration; hear the pealing of bells from high up on an Italian hillside; consider the secret rebellion of fashion; and find yourself inside the dragon dream of Sylvia Plath. Tumbleweed or not, every reader who opens its pages will savor Vignettes & Postcards. Anna Pook grew up in South London and originally trained as a performer, specialising in Musical Theatre at the BRIT School, and graduating from the University of Brighton with a BA in Theatre and Visual Art. An experienced teacher, she has worked in the UK, India and France. From 2009 to 2014, she was the resident creative writing instructor at the Shakespeare and Company Bookstore in Paris. Anna pursued her MA in Prose Fiction from the University of East Anglia, where she was the 2014/15 recipient of the Man Booker Scholarship. She is currently working on her debut novel. Vignettes & Postcards deserves to be on every essayist, poet, author or Parisphile’s shelf to read and enjoy over and over again. Vignettes & Postcards is a collection of humorous, lyrical, and philosophical short stories that I found utterly engaging. Readers like me who have visited Paris will find themselves filled with nostalgia. The editors demonstrated keen literary instincts in anthologizing these fine pieces, and the authors displayed a rare literary sensibility coupled with excellent craft that make the stories worth reading over and over again. Each time I found something fresh and enlightening, and I found it hard to put it down.